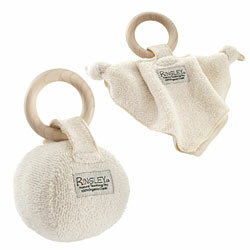 Read RINGLEY NATURAL TEETHING TOYS Archives of Older Product Reviews by TDmonthly. 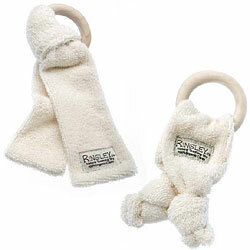 Watch RINGLEY NATURAL TEETHING TOYS Archives of Older Product Videos by TDmonthly. Founded in 2007 by Shaindy Alexander, RiNGLEY is the original Canadian natural teether that combines two efficient teething tools: untreated Maple wood and 100% organic cotton terrycloth. RiNGLEY products come in four varieties to help teething babies and toddlers find a personal solution to help sooth their aching gums and mouths. The award-winning products have passed all North American safety standards and are ASTM toy safety tested. To find a local retailer or for more information visit www.ringleynaturalteethingtoys.com. NEW for September 2009 and making their debut at the 2009 ABC Kids Expo are the RiNGLEY junior and RiNGLEY ball models which are washing machine safe as the wooden ring can be removed easily from the Velcro clasp. Every RiNGLEY is made at the company’s Canadian manufacturer. The wood is natural, untreated and splinter proof Maple - one of the strongest and safest types of wood for children to put in their mouths. Studies have shown Maple is a natural, anti-bacterial material. Thus, germs cannot multiply on its surface. The cloth is made from 100% organic terry cloth that has been used for centuries as an effective and safe surface for babies to teeth on. All RiNGLEY’s are dye free and contain no BPA, Phthalates, PVC or Parabens. During the ABC Kids Expo, look for the giant ten-foot orange tree decorated with all four RiNGLEYs in the Natural Kids section, booth 2230, of the show. Special offers include a free stands or free shipping with the purchase of 30 RiNGLEY products.